If one thing is certain, it is that nurses love what they do. Becoming a nurse is like joining an exclusive club. They go through an intense nursing school program to be able to pass the NCLEX-RN or the NCLEX-PN and finally get that nursing license. Once they have that license, they start working and begin to see things that no one in any other profession can imagine. When nurses get together, they gossip and talk all about their crazy experiences. They have this bond that can’t be described, and they are proud of it. A piece of jewelry displaying their professional title is a great gift idea for any nurse. They will wear it with pride so that everyone knows they are a part of the club. 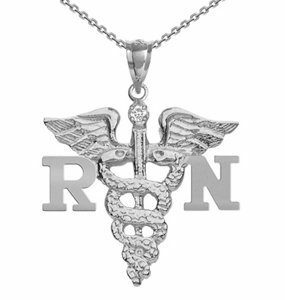 The sterling silver diamond RN charm is a classic piece that any female nurse would love. Crafted by master jewelers, this quality charm features high polished letters and a gently diamond cut medical caduceus. The pendant is suspended from a sturdy sterling silver diamond cut cable necklace (in your choice of 16″, 18″ or 20). A gem quality 0.03 carat round brilliant cut diamond of SI clarity and G-H color is securely set. Measuring approximately 3/4 inch and packaged in a gift box, this is the ultimate recognition gift for the dedicated RN. is a beautiful, Silver-tone, Pink and White Murano glass bead bracelet that features decorated beads with unique and treasured spacers. This bracelet will be beautiful addition to any proud nurse’s wardrobe. Beautiful Silver-tone Nurse appreciation Pandora Style Bracelet, Lovely Murano Glass Beads and Silver-tone spacers, silver-tone snake chain bracelet with Large Heart Lobster Closure. Just 7 in length with 3 rings to adjust for perfect fit. No matter what you get for your favorite nurse, she/he will love it if it’s nursing related. For more amazing nurse gift ideas see our ‘browse all’ section.